The Our Common Bond campaign is making exciting progress thanks to the tremendous support of the USM community. Head of School Laura Fuller recently shared a message with a campaign update—click here to read it. PROST! Thank you to those who joined us for USM Weekend 2018. It was fun to share in a beautiful weekend with our alumni and parent of alumni communities. 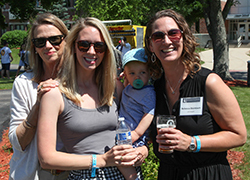 We so enjoyed connecting with each other at the Summer Soiree, Joe Lubar Alumni Baseball Game, inaugural Food & Froth Fete beer garden, campus tours and the J.S. Brunch. 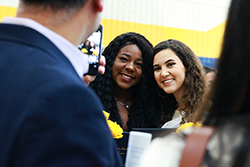 Click here for a photo gallery and more information about Reunion Weekend 2019. In addition, thank you to everyone who served as reunion class organizers—click here for the full list of volunteers. We are proud and excited to welcome the Class of 2018 to the USM Alumni Association! We look forward to providing you with meaningful opportunities to stay engaged with your alma mater and make new connections within the USM community. Click here to explore the many resources available to you as USM alumni. The USM Connect app is a special community exclusively for USM alumni, where you can make connections with other graduates and stay engaged with your alma mater. Find alumni near you, whether abroad or in your own neighborhood. Securely connect one-on-one with other alumni for career advice. Get up-to-date news on school happenings and events. Easily update your address and contact information. Visit the iTunes App Store or Google Play to download the app and start connecting today! 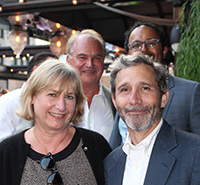 Tha nk you to those who joined us for the New York regional alumni gathering in June at Magic Hour Rooftop Bar (and special thanks to Doug Schadewald ’07 for helping us put it all together!). Many new connections were made and old friends reunited, which is what our events are all about. Have we missed your city (or you)? Email us at alumni@usmk12.org with your current information and suggestions on where you’d like us to visit next; we can’t wait to see you! Click each event for more detailed information. Alumni support is important and impactful to the educational experience of all USM students, and Alumni Association Board President Andy Gordon ’98 challenges you to support your alma mater. Gifts of all sizes matter. USM is a 501(c)(3) organization and all gifts are tax-deductible as allowed by law. We also accept corporate matching gifts. The newest issue of USM Today is hot off the presses. 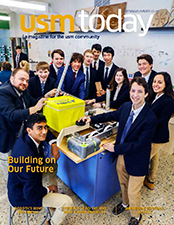 Check it out to read more about USM's award-winning robotics team in its inaugural year, to take a deep dive into the Our Common Bond campaign and USM's history of generosity, and—of course—to find out what your fellow alumni are up to! Visit the magazine website for more information and web-exclusive content. Robert Burch MUS'52 was named the 2018 Alumni Service Award Recipient. R.P. Eddy '90 named USM's 2018 Commencement speaker. Have you recently celebrated a career accolade or milestone? Have you relocated, gotten married, or welcomed a baby? Tell us about it! Send your news to alumni@usmk12.org. University School of Milwaukee, 2100 W. Fairy Chasm Rd, Milwaukee, WI 53217, U.S.